Of course, you don't need me to tell you that in the photo before us we have a picture of heroic deeds; knights in armour charging each other, lances at the ready and pennants flying, but where do you think this historic scene of blood, guts and glory is to be found? And what message does it bring? If you don't already know, have a guess and then click here to see if you are right! Azulejos - Portuguese wall tiles - are found everywhere; for example, telling Biblical stories in churches, decorating the walls of civic buildings with local tales of derring-do and enhancing people's unpretentious homes with protective pictures of the virgin Mary and the saints. On the positive side, tiles are useful in that they don't deteriorate in the same way as paint so by just giving them a quick swill down now and again you will save time, energy and money in the long run. 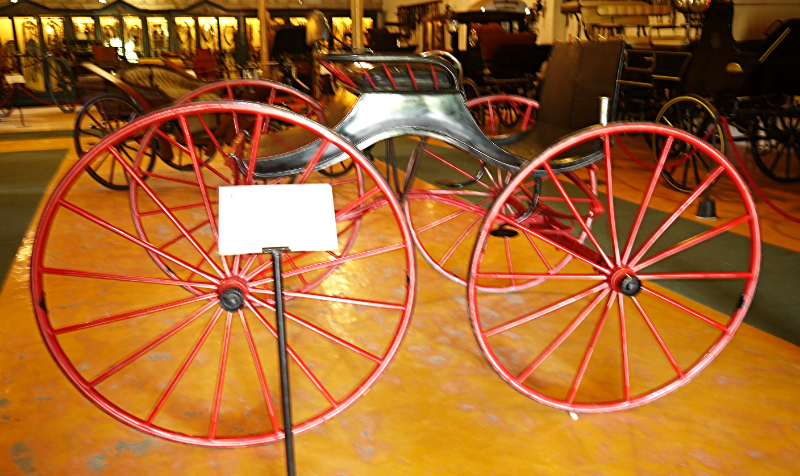 In fact, when they are used in combination with other traditional elements and when the colours are tasteful, I often quite like them. There are times, though, when the only word I can come up with to describe the tiles on some houses is... ugly! For example, when they are a muddy brown – that is the polite description: there is a more colourful expression I would only use amongst friends - I find myself thinking, "Well those must have been a cheap job lot on sale somewhere or why else would anyone have bought them?" I challenge you to say that you would buy these tiles for your house! Of others, a New Zealand friend remarked, "It looks as if they've put lino on their walls." And he's right. The designs are such as are mopped daily on a thousand 1960s kitchen and bathroom floors all over Europe and maybe beyond. 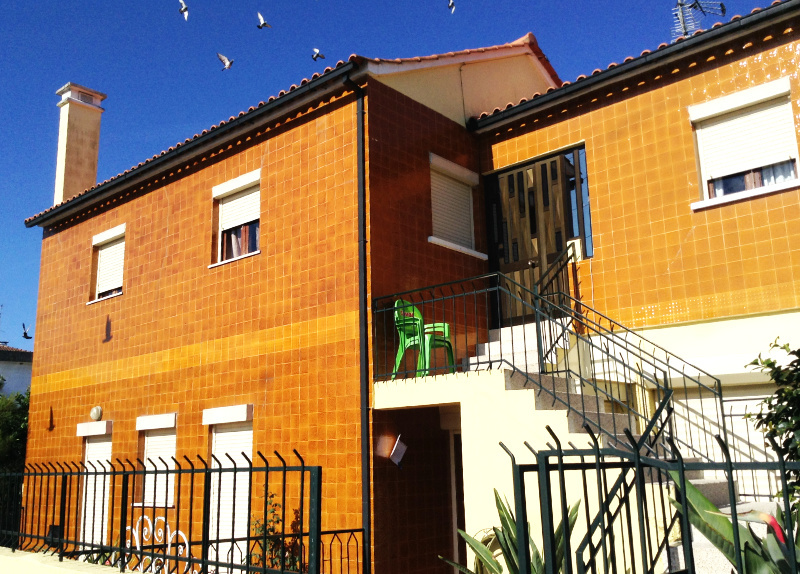 Does this wall from a house near Arcos de Valdevez look familiar? Those tiles wouldn't be my choice of wall covering. Would they be yours? In São Bento station, though, I really am impressed. These azulejos are magnificent. The picture above tells the story of one of the most crucial confrontations on the Iberian peninsula since it represents the birth of a nation. 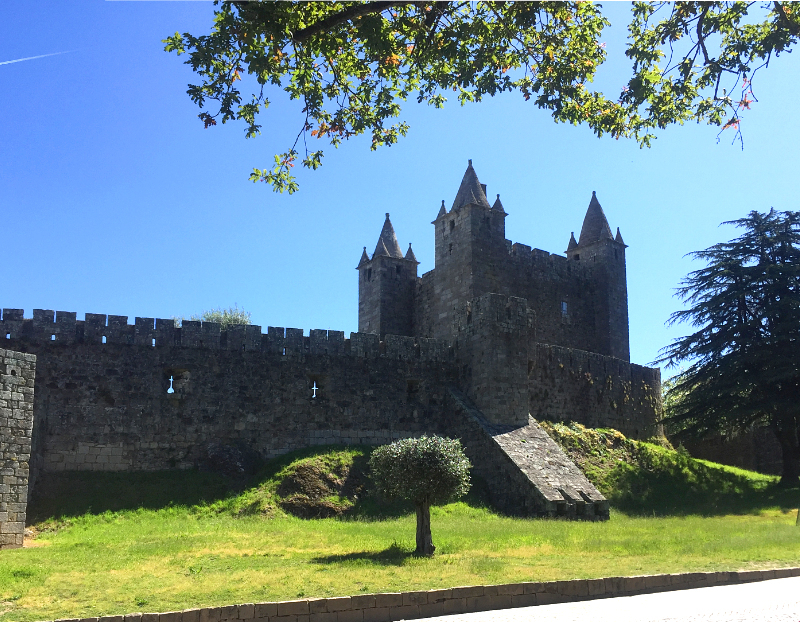 Afonso Henriques – also known as Afonso I of Portugal – took on his cousin Alfonso VII of Leon by invading Galicia. 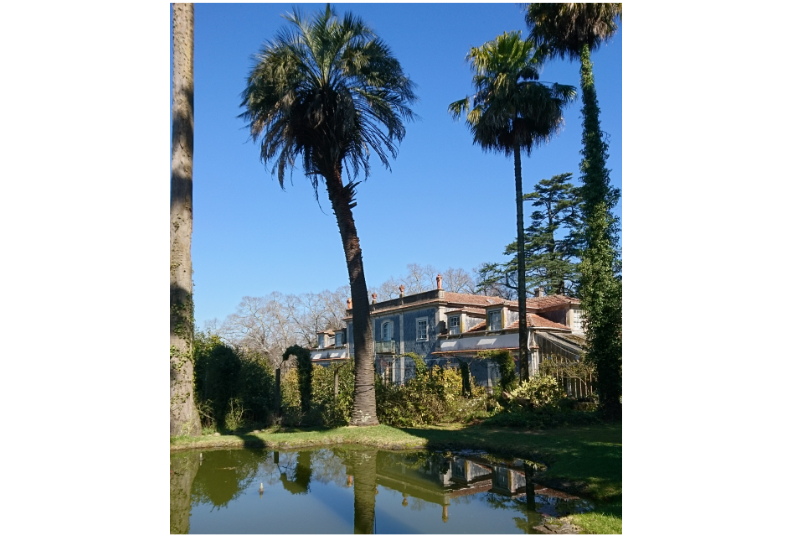 They eventually met by the River Vez and, as was custom in those days, apparently, each king chose his best knights to joust rather than engaging in a full pitched battle. What more inspiring subject could you devise to illustrate the past glories of Portugal and, perhaps, to urge on the people of today to create an equally inspiring future? 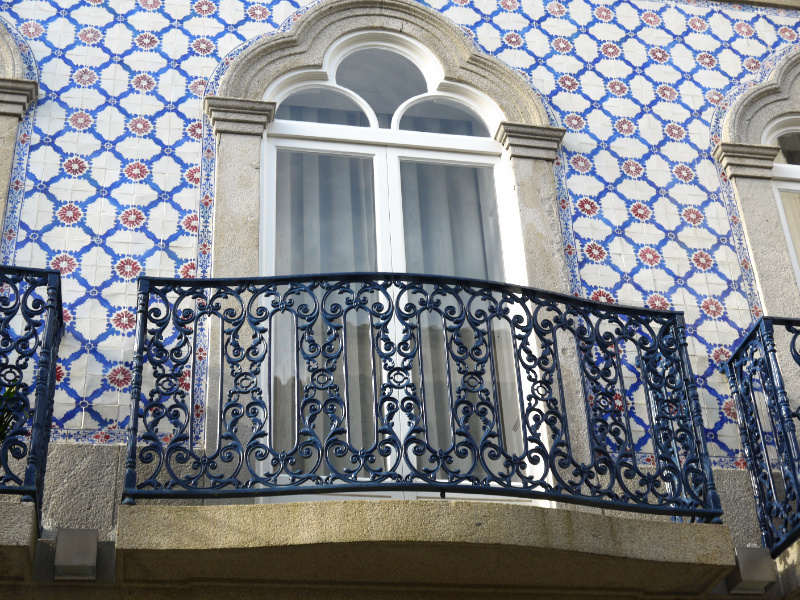 The azulejos below tell of another great event in Portugal's history. This picture shows the arrival of the king Dom Joao I in Porto to celebrate his marriage to Philippa of Lancaster. This was, in effect, the dawn of Portugal's great age of discoveries when brave sailors set out into the unknown in small, fragile wooden ships to discover the rest of the world. Philippa was the mother of several distinguished sons including the one we know as Henry the Navigator. 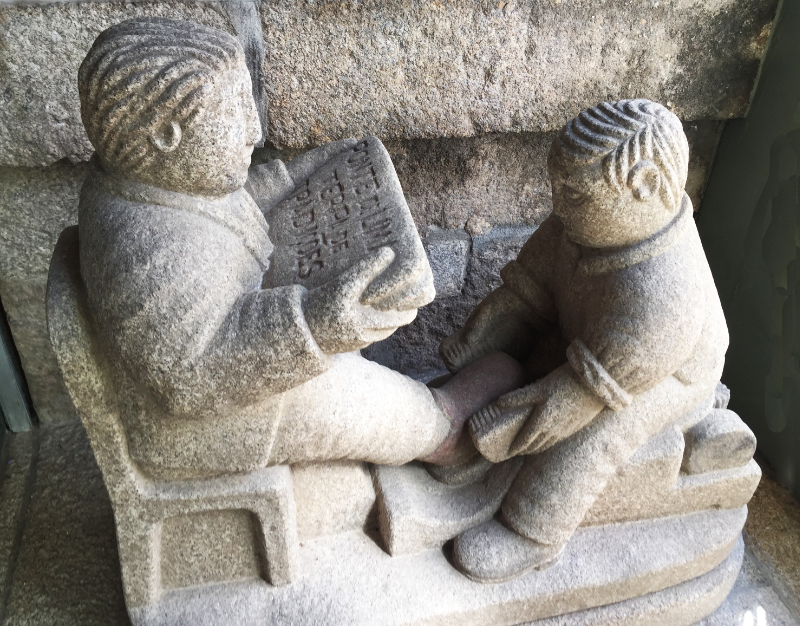 Though he himself never sailed forth to make great discoveries he was the intellectual force behind the discoveries – what today we might call a 'mover and shaker'. 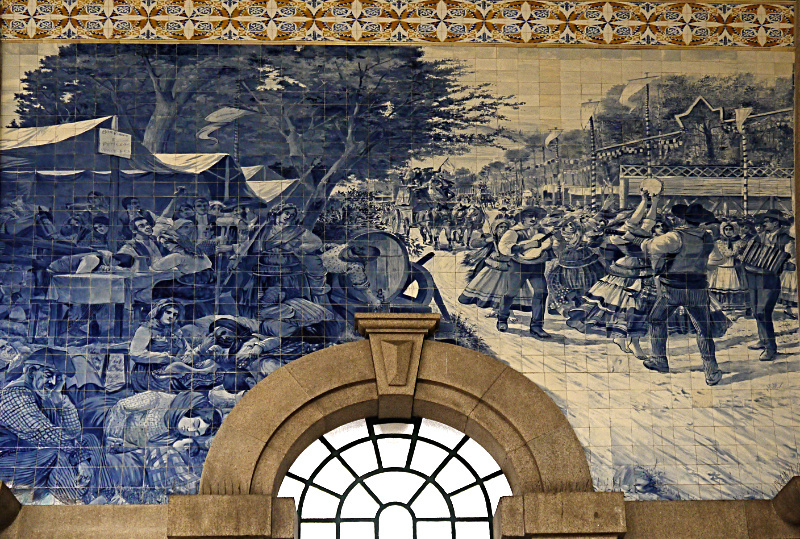 Blue and white, for me, is the most satisfying combination of colours in traditional Portuguese tiles and the azulejos of São Bento station are among the most delightful examples of them at their best. 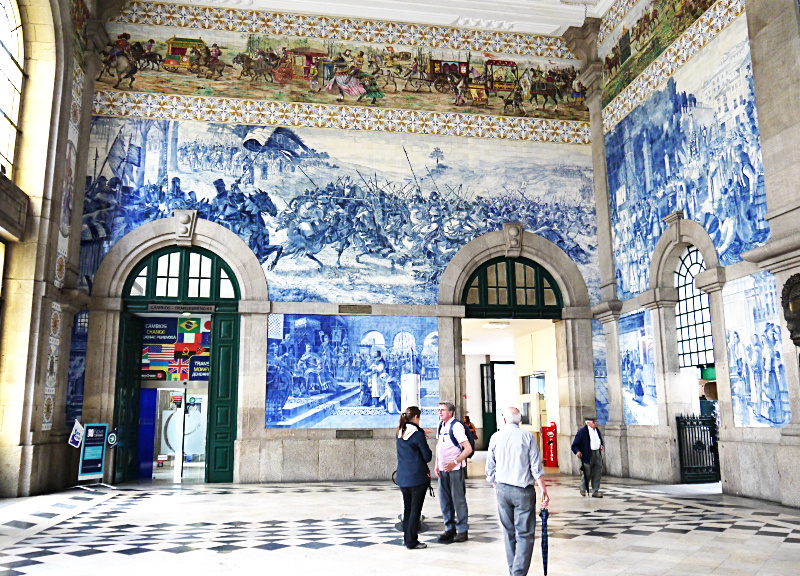 If you would like to see more, visit the station in Porto and gaze at the scenes of traditional Portuguese life as well as the grand historical pageants. Here we have countryside pursuits; fruit picking in the orchards and trading on a river, probably the Douro. On the left, the other mainstay of the festa is taking place. Families are carousing around trestle tables and a huge barrel of wine while those who have eaten, drunk or danced too much are fast asleep and snoring. As the phrase is today: "What's not to like?" Perhaps you are of a more serious turn of mind, though. 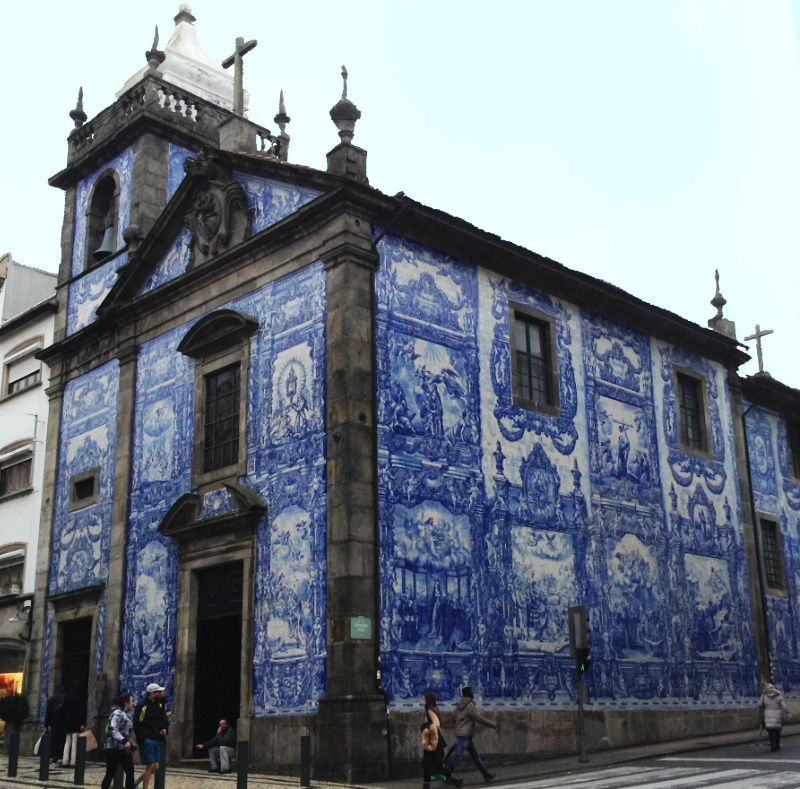 Then pop up the road to see the equally impressive, azulejo-covered chapel of Santa Catarina (Capela das Almas de Santa Catarina) on the Rua de Santa Catarina, one of Porto's main shopping streets. The chapel itself is eighteenth century but the tiles, showing scenes from the lives of St Francis of Assisi and St Catherine and produced by a ceramics factory in Lamego, were added in 1929. I think Portuguese tiles are an acquired taste. It takes time and increased awareness to appreciate them. In many cases, I'm coming to like them better - even love them - but there are some, mostly on domestic buildings, that I'll never, ever, come to terms with. And now, I want to let you into a secret. When our house is finished, we are going to look for a craftsman painter of azulejos and order a panel for the wall of our house, maybe by the front door. What subject shall we choose? We're not sure yet but perhaps a mountain scene with a village espigueiro, a couple of Minhoto cattle and a little old lady in traditional clothes holding a pitchfork or mattock. Gorgeous in detail if weird in overall efffect - maybe that's the Anglo Saxon response; we don't do that sort of thing here! Interesting that they are in the "blue and white" tradition of willow-pattern plates; the blue must be an easily made colour. 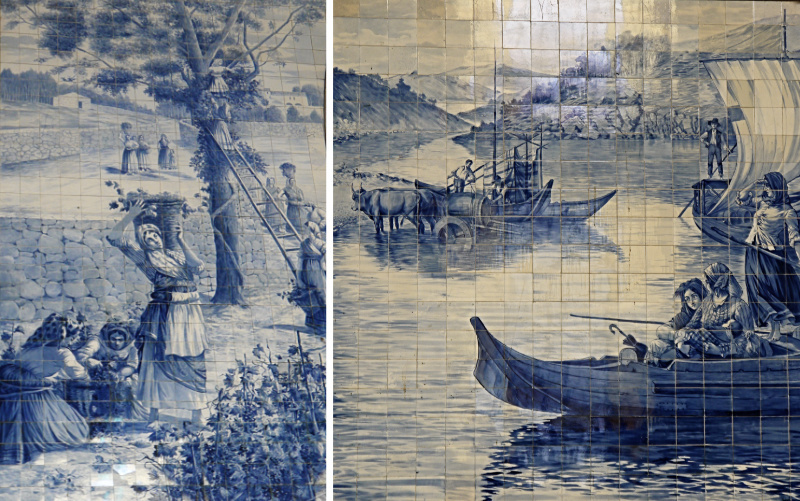 The willow pattern tradition is, I think, essentially Chinese whereas Portuguese (and Spanish) tiles are almost certainly in the tradition of Arab/Moslem tiling as Spain was colonised for several centuries and Portugal for a couple. I agree that for Anglo-Saxons such wall coverings are foreign to us but I wonder if our ancestors, who were used to brightly painted stone on our cathedrals and churches, would have found them more immediately sympathetic. Thanks for your recommendations! It’s actually nice house. Design of tiles are also amazing. 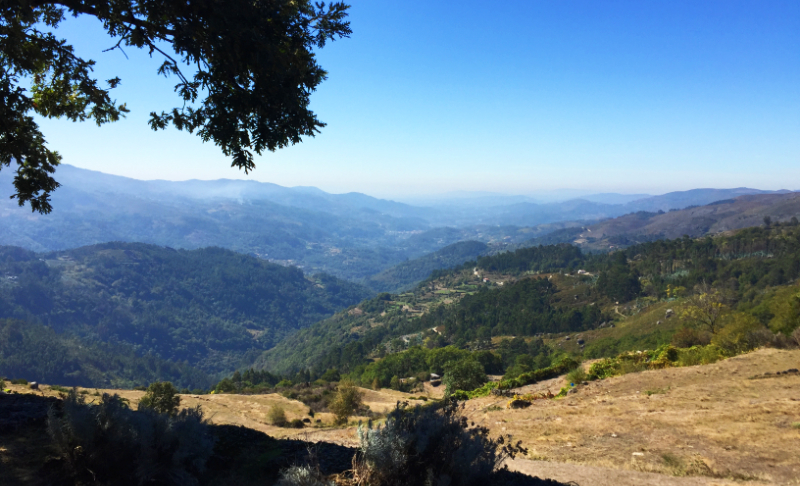 Loved reading this beautiful content on singing the Blues in Portugal.